Here are two free opt in templates that I created for you to use to increase your email signups. 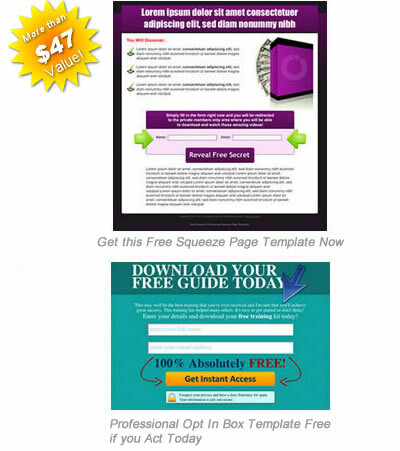 The download is free and includes 1 squeeze page template ready to go on your site and 1 opt in box template that can be placed on any page to improve appearance and get great conversion rates. Thank you for these wonderful tools. Can you please help me use them appropriately. I am not sure how to install the optin pages and squeeze pages on my website. I recently added a video in the members’ area that walks you through uploading the templates to your website. There is also a recent addition for WordPress users if that’s your style. Jane, Once you have registered you will receive login details via email. I am Kimberly Rhett and I am ready to get started. I bought today the templates pack. How do i can login into your pack? I bought the templates pack today. I am overwhelmed not only by the most proffesional templates i bought, but above all, with the support that comes with it. I am really excited to have taken the decision to buy the templates. Keep up the good work. I did purchased your offer.